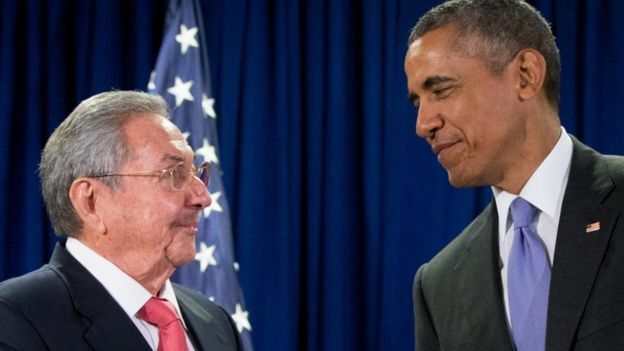 U.S. President Barack Obama stands with Cuban dictator Raul Castro at the United Nations headquarters on Sept. 29, 2015. (BBC News) – The United States eased a number of trade restrictions with Cuba’s communist government on Tuesday, in President Barack Obama’s latest attempt to bypass the US Congress’s economic embargo on the island. American companies are now allowed to lend money to Cuban entrepreneurs and to invest in infrastructure projects. The new measures also make it easier for US studios to shoot films in Cuba. President Obama restored relations with Cuba last year in a first step toward achieving his goal of re-establishing diplomatic relations with the communist government there. The latest measures were announced by the US Commerce Department on Tuesday and came into force on Wednesday. The key difference between this announcement and earlier efforts to ease trade with Cuba by the Obama administration is that this time the new rules will apply to trade with Cuban government agencies. Previous steps were solely aimed at strengthening private entrepreneurs on the island, explains the BBC’s Will Grant in Havana. 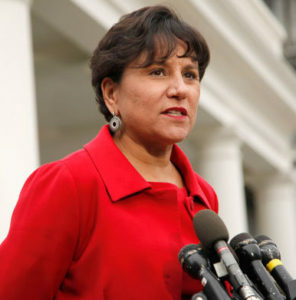 Billionaire Penny Pritzker was nominated to serve as U.S. Secretary of Commerce by President Obama in May 2013. The easing of export restrictions will apply on a case-by-case basis in areas which “directly benefit the Cuban people,” said U.S. Commerce Secretary Penny Pritzker. The measures also lift further restrictions on Americans traveling to Cuba, making the current ban on tourism more difficult to enforce. The embargo has been in place since 1960 and remains a contentious issue in relations between Cuba and the US. Reprinted here for educational purposes only. May not be reproduced on other websites without permission from BBC News. Visit the website at bbc .com/news. 1. If most U.S. trade with Cuba remains banned under the economic embargo, how has the Obama administration lifted some trade restrictions? 2. List three exchanges the new measures will now permit. 3. Why has President Obama used executive action to work toward his goal of ending the embargo with Cuba? 4. What is the key difference between President Obama’s latest action on Cuba and his efforts to ease trade with Cuba last year? Since there is virtually no private sector in Cuba, opening trade would only help the government, not regular Cuban citizens. The 90% state-owned economy ensures that the Cuban government and military would reap the gains of open trade with the United States, not private citizens. How does this contradict U.S. Commerce Secretary Penny Pritzker’s defense of the easing of export restrictions? The U.S. embargo on Cuba began over 50 years ago under President John F. Kennedy. Cuba has been led by communist dictator Fidel Castro and in the last several years by his brother Raul Castro. They deny the Cuban people basic human rights/freedom. Find information under “Background” and “Resources” below the questions. This BBC News article makes no mention of public and congressional opposition to this latest plan but there are many who do. There are also many like President Obama who believe they can help the Cuban people more by lifting the embargo even before all of the political prisoners are released – that it will influence Castro to change. What do you think? Is lifting the embargo and restoring normal diplomatic relations with Cuba’s communist dictator the best way to help the Cuban people gain freedom and economic prosperity? Explain your answer. Ask a parent or grandparent the same question. One of the principal purposes of the President’s Cabinet (drawn from Article II, Section 2 of the Constitution) is to advise the President on any subject he may require relating to the duties of their respective offices. Department heads advise the President on policy issues and help execute those policies. U.S. Secretary of Commerce Penny Sue Pritzker is an American billionaire businesswoman, entrepreneur and civic leader who is currently serving as the 38th United States Secretary of Commerce. She is the founder of PSP Capital Partners and Pritzker Realty Group. He father was a co-founder of Hyatt Hotels. In July, 2008, Pritzker and her husband hosted a $28,500 per plate fundraiser for Obama’s campaign in Chicago with billionaire businessman Warren Buffett and his wife, and Obama advisor Valerie Jarrett. She was national co-chair of Obama for America 2012 and was the national finance chair of President Obama’s presidential campaign in 2008. Read about the U.S. embargo on Cuba at wikipedia. Read some of the arguments for and against the embargo at Cuba Embargo pro-con.